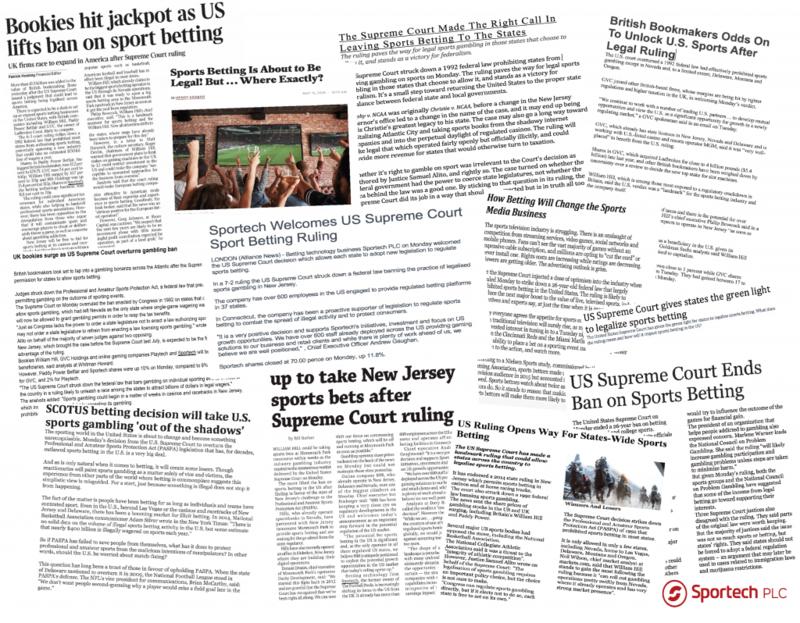 Sportech welcomes the US Supreme Court decision which effectively permits each state to now adopt legislation to permit and regulate sports betting. We are well positioned to act quickly and decisively in states that pass legislation permitting sports betting in the wake of this decision. With over 600 employees across the US engaged in providing secure, regulated betting platforms to 90 licensed operator customers (racetrack, casino, off-track betting network, and online betting operator) in 37 states. The Company will be leveraging this broad presence to deliver sports betting services to those customers. In Connecticut, where we own and operate a network of off-track betting facilities and a licensed online and mobile betting service, the Company has been a proactive supporter of legislation to regulate sports betting to combat the spread of illegal activity and to protect consumers. The Company believes that Connecticut will be an early adopter of a comprehensive and rigorous regulatory framework for sports betting, under the oversight of the Department of Consumer Protection, and we are prepared to act quickly to provide eligible Connecticut residents with a platform for safe and legal sports betting through Sportech’s venues and digital platforms. For more information on Sportech Venues, visit the Sportech Venues page.